Ninety five percent of town of Kamikawa is covered with forest. has been serious since the loss of their primary industry, forestry. people in the town but it has decreased to less than 4,000. 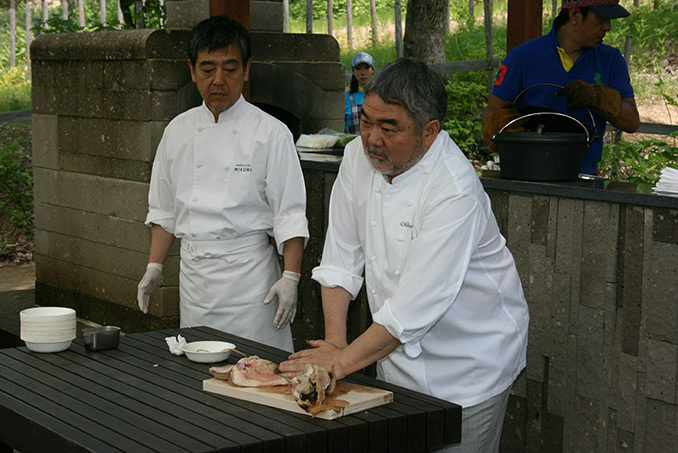 What supports their life is tourism to Daisetsu National Park and hot spring Soun-kyo Onsen. Unfortunately, it is not the reliable source of their income. There are only two million visitors a year, which is two third of their high peak in history. 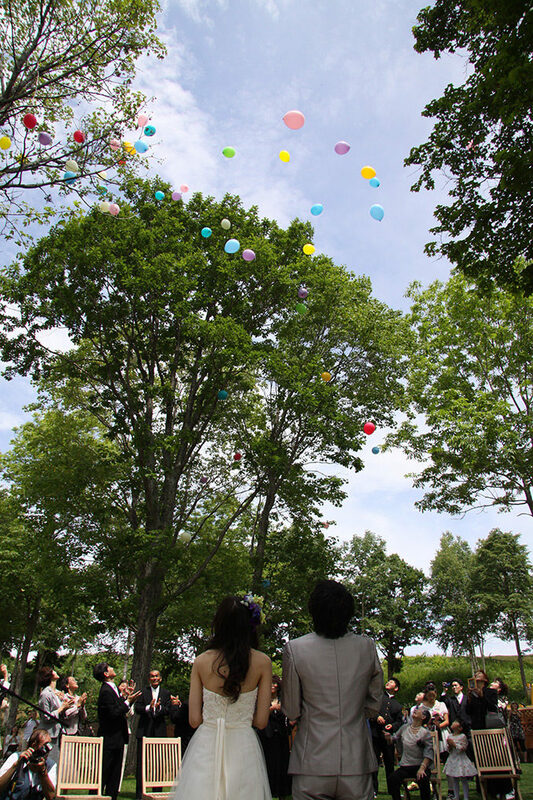 There were two kinds of physical and mental gaps in Kamikawa. One was residents versus tourists due to a lack of interactions. The other was the gap between the industries; agriculture, tourism and businesses. This was caused by a lack of interactions. Majority of the resident is elderlies and the town struggled with the labor shortage. The deteriorating in many ways; they had been a town with not pride. Outdoor spaces, gardens, should be in daily life. It could be a good commercial resource attracting tourists, though it is not the grounds why we need an access to an outdoor space. Through this project, we wished to provide a garden within reach of residents and a kickoff start of their town revitalization. The project was to attract tourists from outside the town as well as to provide local community with a place to gather. We strongly hoped to produce opportunities that people interact. Through the interactions among locals and visitors outside the town, they can keep refreshing their ideas and connecting the outside the community. 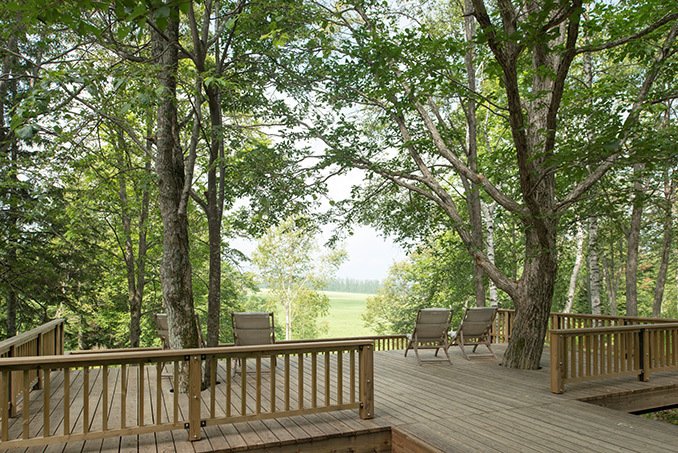 “Forest Banquet Garden” consists of an outdoor living room, dining and kitchen area, bar, terrace and decks. It is designed for relaxation and retreat in the fresh forest air with the warm hospitality. 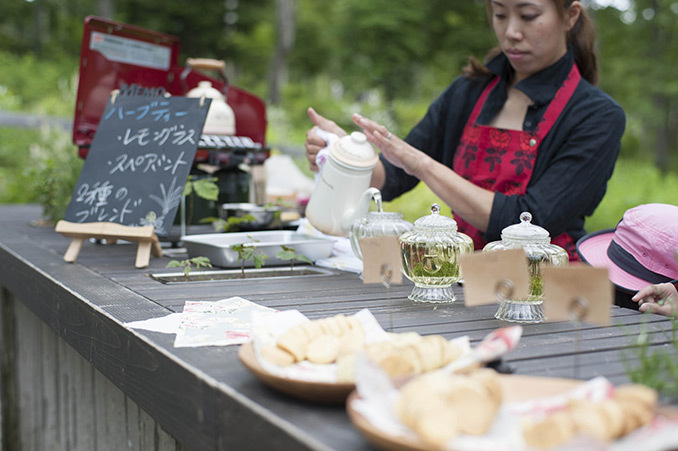 “Forest Dining & Kitchen” is designed to host cooking classes and wood craft workshops. “Forest Living Room” is to let visitors spend relaxing time swinging in the hammock and read books in the woods. “Forest Bar” is to provide people with opportunities to chat over their favorite beverage outside under gorgeous tree canopies. 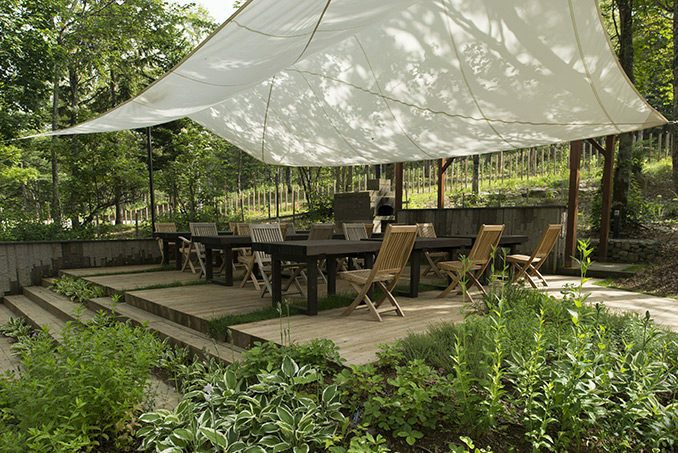 “Healing Terrace” is a space with borrowing view of Daisetsu mountains and local farm lands. 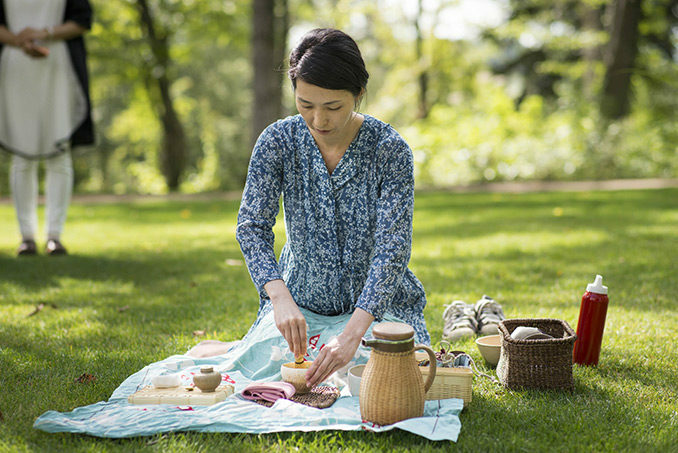 There is even a space for having breakfast for sleep-over guests with the spectacular view of Daisetsu Natural Park. Supporting local industries, it was built with locally excavated stones, locally produced timbers and plant materials. The garden design was an opportunity to introduce the columnar jointing structure, the symbol of the Soun-kyo Hot Spring. 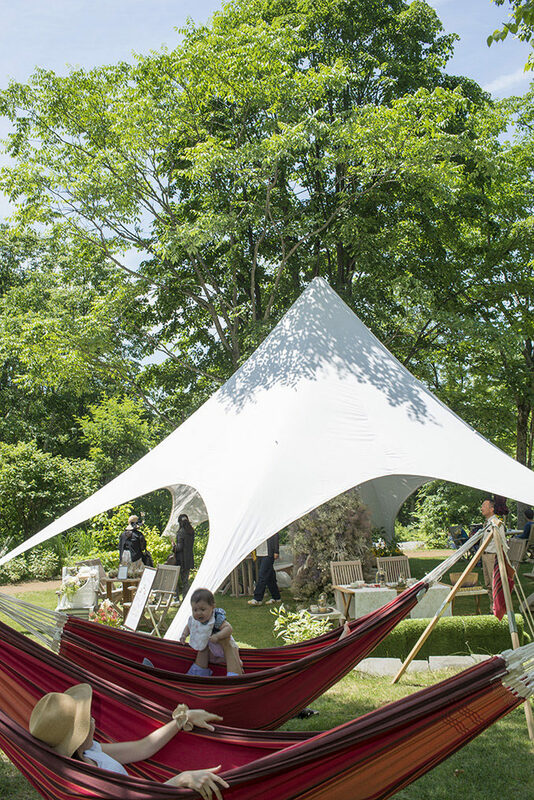 The famous Asahikawa was featured for site furnishing. Kamikawa region is famous for internationally acclaimed ski jumpers. 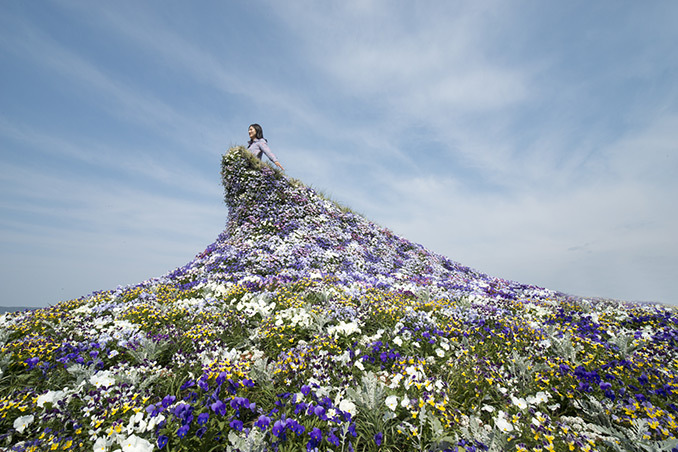 “Dress Garden” was designed being inspired by the ski jumping hill. 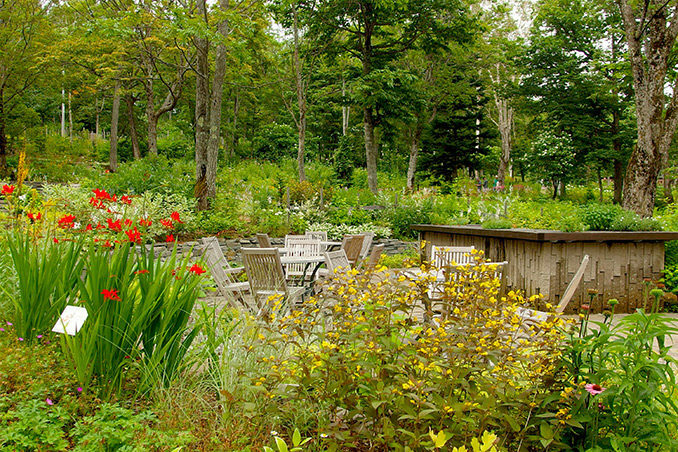 Boarders with natural undulations to enhance plant beauty. Vistas with dramatic changes by elaborating garden paths. Accessibilities maintained with universal 5 percent slope. 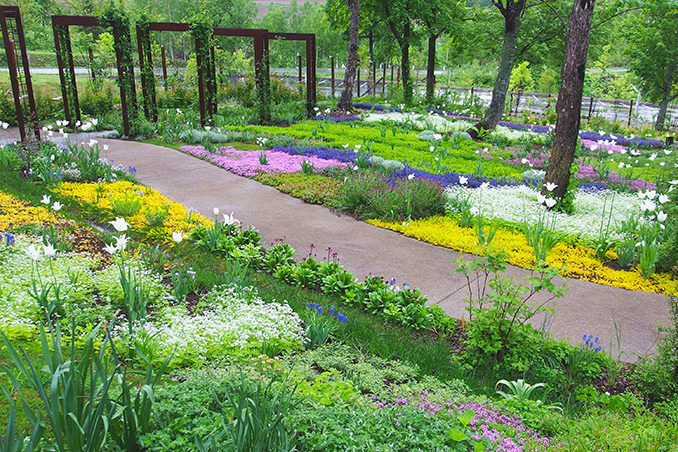 Garden therapy introduced by installing plants where it can be touched and felt. Enhancing wellbeing was also an important factor for the design. The garden paths were intently designed on the undulating hills. 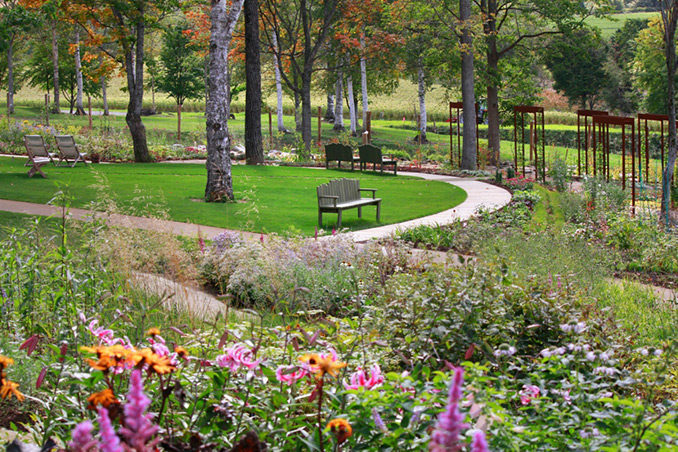 We not only designed that garden but also provided the programs to grow community bonds. We successfully involved the community in the discussions and management of the garden. Involvement – We designed together with the local horticultural organizations. Discussion – We worked together with neighborhood community boards. Participation – Plant installations were done by many residents. Advantage – Town residents were encouraged to use the garden space even before the official opening. Education – Town residents were invited to study plant materials for future maintenance and to be tour guides. 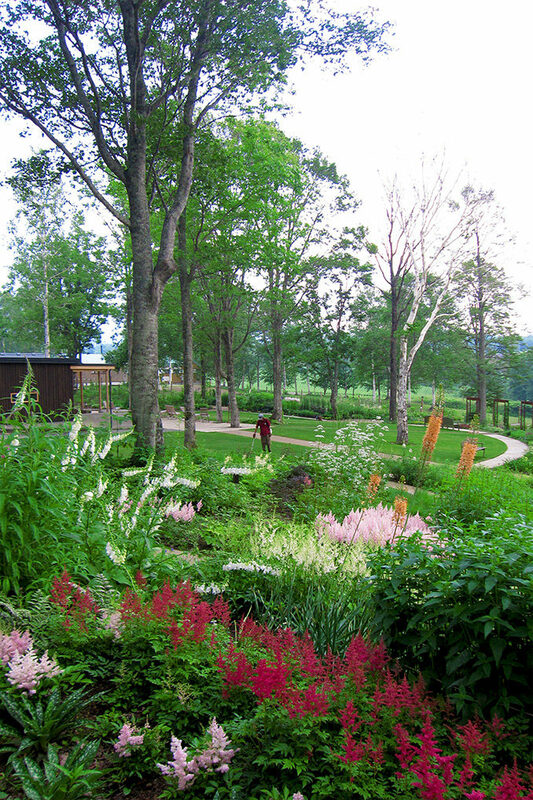 Landscape Design – We proposed town residents to work on the rest of the town as their projects planting flowers with their knowledge and skills that they have gained through “Daisetsu Forest Banquet Garden” project. How to use the garden space is very important and the use of the space could solve the most common problems of the current human society. The end of the design and construction period is never the end of the landscape architectural project for us, especially with this project. 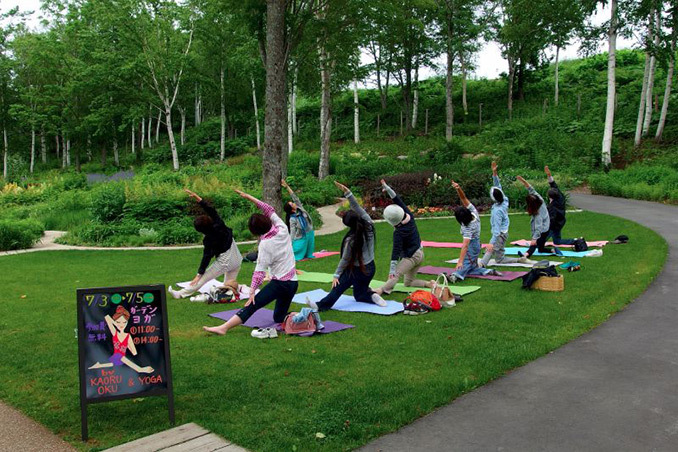 The forest garden is used for a wide variety of activities, programs and organizations. It is for both recreational and motivational uses to enrich the daily life of the town residents for their health, communications and commercial development. The various programs also attract many visitors, which helps the local economy with the growing tourism.